What's it take to be a real collector, a true fan who is devoted to that which drives him to buy, love, and hoard? Ask Chris, the guy who's number one in line to buy a pair of the Carolina-blue, Tinker Hatfield-designed Air Jordan XX3's. If you're like him, you'd wait outside Foot Locker on 34th Street in cold January weather for four days to be the first of 23 to buy a pair. 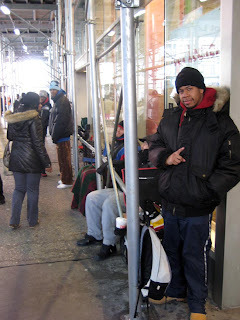 Chris, (left, Mr. #1), came in from Jersey on Monday at 4pm, and will stay out here till the shoes go on sale Friday. So far, Foot Locker on 34th says they'll sell the shoes Friday morning, not after midnight on Thursday. [UPDATE] newest word from the store is Thursday - midnight, check back or call the store as this times seems arbitrary. [NEWEST UPDATE] Friday morning at 6am. Same for Footaction, Retro was right! #2 (Mike) & #3 (Marco) in line got here yesterday. #4, Retro Will, a self-proclaimed "big sneakerhead," arrived this morning. So what's the big deal? Obviously you're not a sneakerhead. This is the launch of the $230 limited-release shoes; there will be 23 pairs sold at 23 stores in the country. Retro Will says 8 of the 23 stores in the US are in New York City, and two of them are on 34th Street: Foot Locker and Footaction* at 1 Penn Plaza. What are these guys going to do with the shoes once they have them? Chris, who owns 65 pairs of Air Jordans, says he "might wear them in a year or two." Retro Will has 40 pairs but likes to "double-up" his sneakers. He's going to have a hard time doing that with the blue XX3 as they're selling just one per customer; stores will have two in each size. For those of you interested, so far there's an 11, a 10 1/2, a 9 1/2, and an 8 in line*. What these guys aren't doing with these shoes is reselling them (they could easily get over $1,000, probably on Friday morning at 10am). True collectors like Retro and Chris look down on such practices; Chris calls them "hypebeasts." I'm so adopting that term. *If you're planning to wait in line, call ahead and find out the store's policy. Footaction is not admitting to selling the XX3 yet; they say call Thursday morning. But I'm thinking Retro Will is a good source. The guys say such tactics are used to weed out the "poison" - resellers. Forecast for tomorrow: A chance of light snow before midnight. Cloudy during the early evening, then gradual clearing, with a low around 19. North wind between 11 and 15 mph. My question is - will Chris be able to jam this sturdy new shoe onto the blackened, frostbitten stumps he'll have for feet after staying out there for three days? And even if so, was it worth it? Thanks, Ed, my forecast man. It's always worth it for fashion.